Horrible Histories - это серия очень популярных в США и Британии книг знаменитого Британского писателя Терри Дири. Ориентирована на подростков. По сути дела это очень веселые, доходчивые книги по истории. Продажи книг серии в мире уже перевалили за 10 миллионов копий, Horrible Histories переведены более чем на 37 языков. 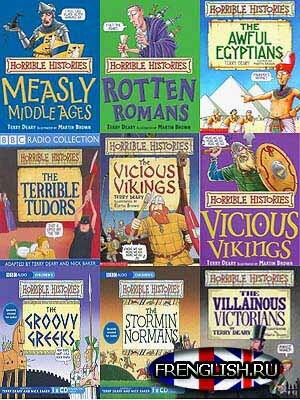 Horrible Histories is a series of illustrated books published in the United Kingdom and now from 2007 officially in India by Scholastic. They are designed to get children interested in history by concentrating on the trivial, unusual, gory, or unpleasant. The series has proved exceptionally successful in commercial terms. The books are written by Terry Deary and illustrated by Martin Brown and Philip Reeve. The first books in the series, The Terrible Tudors and The Awesome Egyptians, were published in June 1993. In May 2007, 8 of the original series of books were relaunched with new covers and extra content. The remainder are in the process of being republished in the new format, with a completion date of January 2009. Published by Scholastic UK, Horrible Histories has sold over ten million copies in the UK alone and has been translated into 37 languages worldwide.